Gambian President Yahya Jammeh has hit out at regional mediators urging him to step down, saying he will not be intimidated. The West African regional bloc Ecowas had called on him to honour his initial pledge to accept electoral defeat. Mr Jammeh, who subsequently said the 1 December poll was flawed, added that he would defend his country if need be. Ecowas had said military intervention might be a possibility if diplomatic efforts failed. Mr Jammeh has launched a court action to annul the vote after the electoral commission changed some results. The commission insists the outcome was not affected by an initial error and property developer Adama Barrow defeated Mr Jammeh. Mr Jammeh seized power in the tiny country in 1994 and has been accused of human rights abuses, although he has held regular elections. In a 45-minute speech at the African Bar Association on Tuesday night, Mr Jammeh defended his position, saying West African leaders had violated the Ecowas principle of non-interference. “Who are they to tell me to leave my country?” he said during his televised speech. “I will not be intimidated by any power in this world. I want to make sure justice is done. The BBC’s Umaru Fofana in the capital, Banjul, says it was his first public reaction to last week’s intervention by Ecowas leaders, and he reiterated his call for fresh elections as the only way to resolve the impasse. Meanwhile, a spokesman for the opposition coalition that backed Mr Barrow has said Mr Jammeh will not face prosecution after leaving office. “President-elect Barrow says he is going to treat outgoing President Yahya Jammeh like a former head of state and would consult him for advice,” Halifa Sallah told the AFP news agency. 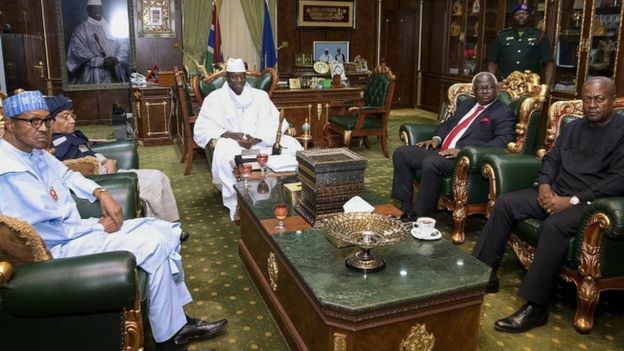 Some analysts have suggested that reports that Mr Jammeh could face prosecution were behind his U-turn. Human rights groups have accused President Jammeh of committing serious abuses against opponents during his 22-year rule. The Gambia has not had a smooth transfer of power since independence from Britain in 1965.